UC Movement for Efficient Privatization (UCMeP) | Privatize Now! Ask Questions Later. 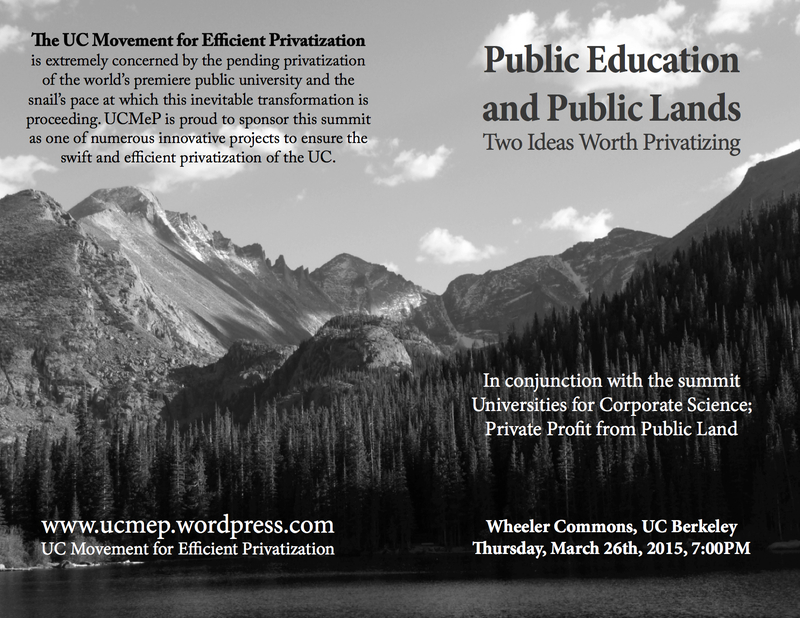 About the Event: “Public Education and Public Lands: Two Ideas Worth Privatizing” is part of the UC Berkeley initiative “America’s Most Lucrative Ideas: The Next ~1 Year, Or About As Much Foresight As We Can Manage,” a partnership with the symposium on Universities for Corporate Science, Corporate Science on Public Land to celebrate the cooptation of land for future generations of wealthy white people. The year 2015 marks the 100th anniversary of a conference held in Berkeley, hosted by UC Berkeley alumni Stephen Mather, industrialist and Borax millionaire, and Horace Albright, where they first signed a pact that would eventually lead to privatizing public land and the displacement of brown people (loads of California’s native folks had already been Manifest Destinied by then). The National Park Service was created in 1916, and Mather and Albright went on to become its first and second directors. With its business partners, UC Berkeley looks forward to the next 100 years with a variety of privatization activities and programs, including a summit on how to further exclude community members from public debates, public schools, and public lands. The UC is actively looking to continue a century of exclusions of non-white, non-wealthy community members and hopes this conference will galvanize the continued financialization of whatever public things remain. Tonight’s program has been brought to you by the University Movement for Efficient Privatization, UCMeP. The 10th chancellor of UC Berkeley, Nicholas “I Don’t Meet With Identity Groups” Dirks is an internationally renowned master of cooptation. Dirks’ previous anthropological scholarship on colonialism and the brutalities of the Indian caste system bolsters his credibility as a liberal critic of class and race disparities. This research has been crucial for securing his reputation in the hustle for private dollars to stuff Berkeley’s coffers. Though Dirks is the most highly paid Chancellor at the UC, he rakes in an impoverishing $501,404 a year. As Chancellor, Dirks has contributed to class stratification and racial exclusion, measures whichUCMeP believes will make for an overall healthier, wealthier, and whiter campus climate. Wisely refusing to meet with aggrieved and underpaid workers, undocumented students, concerned black students, trans and genderqueer folks, and survivors of sexual assault, Dirks instead turns his attention to more lucrative matters. Tonight, Dirks will unveil the UC’s newest project: Universities for Corporate Science, Private Profit from Public Land, a project that rekindles the colonial zeal of centuries past. After favoring financial gain over student and community needs for education and research at the Gill Tract Farm, Dirks is turning his gaze northward. Directing massive UC resources to build the privately-funded “Berkeley Global Campus at Richmond Bay,” Dirks will work hard to ensure that this new UC venture seizes land in the city of Richmond, indebts this working class city to secure UC profits, and displaces black and brown community members in the service of $cience. To this, we say Bravo, Chancellor Dirks! Brinkley is an author, Professor of history at Rice University, and a fellow at the James Baker Think Tank for Public Policy. He is the history commentator for CBS News and a contributing editor for Vanity Fair, The New York Times, The New Yorker, and TheAtlantic Monthly. A number of his most recent publications have become bestsellers, including The Reagan Diaries, a magical realist exploration of Ronnie’s union-busting fantasies; The The Boys of Pointe du Hoc: Ronald Reagan, D-Day and the U.S. Army 2nd Ranger Battalion, an ode to Euro-American masculinity and the army’s love affair with all things “Private”; and The Wilderness Warrior: Theodore Roosevelt and the Crusade for America, an epic tome about Roosevelt’s imperial visions for the Anglo-Saxon race and how-to guide with illustrations for conquering the great outdoors. Janet “We Don’t Have To Listen To This Crap” Napolitano leads a “public” university system that generates significant private capital with 10 campuses, 5 medical centers, 3 affiliated national labs, and now its own $250 million venture capital firm! Napolitano is a distinguished bureaucrat with a record of surveillance implementation, and domestic and border policing, experiences which she brings to her work in higher education through the DHS Campus Resilience Pilot Program, where campus police train alongside global army personnel and work with ICE. As Governor of Arizona from 2003-2009, Napolitano focused on privatizing education from pre-kindergarten through higher education, where she continues to build a “dependable pipeline” to transport American children from kindergarten to postgraduate study and jobs in the cyber surveillance industry. Secretary of DHS from 2009-2013, Napolitano oversaw the deportation of over 1.5 million immigrants, and the hyper-militarization of local police departments, readying them for our recent war against protestors. While at the UC, Napolitano championed the near-total obliteration of the California Master Plan, a communist policy that guaranteed Californians affordable access to publicly subsidized higher education. Napolitano recently proposed a 27% increase in UC tuition, announced an enrollment freeze for Californians, and expressed an interest in dramatically expanding out-of-state enrollment for which students pay nearly three times as much (we could hear our creditors at Moody’s cheering!) Napolitano managed to accomplish this while earning a paltry $570,000 a year with a $8,916 annual stipend for car expenses and a $9,950 monthly rent covered by the UC. Tonight UCMePwill be awarding Napolitano for her efforts in dismantling the public sphere and for the omnipresent security-industrial complex she brings to the UC (wave to the surveillance cameras!). The UC Movement for Efficient Privatization is extremely concerned by the pending privatization of the world’s premiere public university and the snail’s pace at which this inevitable transformation is proceeding. UCMeP is proud to sponsor this summit as one of numerous innovative projects to ensure the swift and efficient privatization of the UC. We awoke to startling news this morning that Janet Napolitano would be stepping down as Secretary of Homeland Security to succeed Mark Yudof as the 20th President of the University of California. Initially we here at UCMeP were satisfied with the curious appointment… until we learned from former film executive Sherry Lansing (head of the UC’s search committee) who was offered the post ahead of Napolitano. We here at the UC Movement for Efficient Privatization (UCMeP) are pleased to announce that the UC Davis Police Department is now offering a timely and only mildly psychotic practicum course in authoritarianism. Below is Lt. John Pike demonstrating a key technique of this curriculum. It certainly takes its cue from the more “hands on” approach recently implemented by UC Berkeley Police Chief Mitch “Make ’em Hurt” Celaya. If you would like to ask Lt. John Pike any questions about his innovative pedagogical method, please feel free to email him at japikeiii@ucdavis.edu, or call him at 530-752-3989. Similar to analogous movements around the world, Occupy Cal aspired to be a disgusting display of consensus-based decision making and activist programming designed to facilitate dangerously political conversations about the most – rather, least – pressing issues of our day. Like UC Berkeley Chancellor Robert Birgeneau and UC Police Chief Mitch “Make ‘em Hurt” Celaya, we here at the UC Movement for Efficient Privatization (UCMeP) wholeheartedly believe that such mass enactments of so-called “democracy” by UC students, workers, and faculty must be ruthlessly crushed. Students should in no way be allowed to freely speak out or assemble for political and educational purposes at UC Berkeley. It goes against everything that the UC Regents, the UC Police Department, and the UC Office of the President have been so virulently working for in recent years. Any attempt by UC stakeholders to educate one another in a sociable and sustainable manner about budget cuts, austerity, and the gloriously growing economic gap in this country deserves nothing less than the most pitiless pummeling. Thankfully, a highly skilled and well-remunerated team of crisis managers were called in to UC Berkeley on Wednesday to make crystal clear before the entire world the UC’s official position on calls to democratize and save the world’s premiere public-soon-to-be-private university. We oligarchs may have won the battle, but we are far from winning the war. Our vested (and vesting) interests in the university are by no means secure. 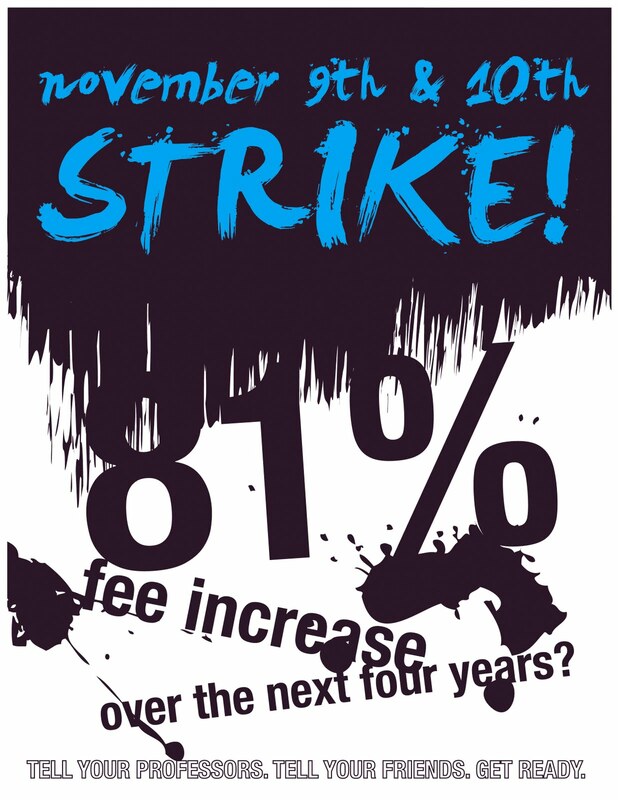 UCMeP regrets to inform its plutocratic peers that this coming Tuesday promises to be the most terrifying day yet in the history of the privatization struggle at the UC. The same radical elements who had the gall to pitch a few tents on Sproul Plaza are now calling for not only the reestablishment of Occupy Cal, but a student strike across higher education in the once golden state of California this coming Tuesday, November 15. UCMeP has full confidence that everyone’s favorite gun-waving paragons of public safety at the UC Police Department will come out batons swinging (and as we have heard, shotguns blazing) to defend the UC’s proud tradition as a tent-free institute of indoctrination and instrumentalized knowledge production. If we have learned anything from the tepid swamp that is Occupy Oakland, pepper spray, tear-gas, truncheons, and flash-bang grenades will not be enough to quell the self-pitying sensibilities of America’s cantankerous youth. UCMeP believes that everyone must pitch in this Tuesday to defend the privatization of the the University of California (and public education worldwide). We all must take the law into our own hands and—like UCPD—go beyond the law to furiously smother even the most meekly-articulated demand for democracy at the UC. UCMeP implores you to join us in protecting Cal from those who want to expropriate it for the public good. We are happy to see several groups and individuals actively working from within to combat the anti-privatization movement at the UC. But mere internal tactics like red-baiting, moralistic finger-pointing, and turning people over to the police is not nearly enough to ensure eternal triumph for the 1%. The goals of Mockupy Cal are simple: we will vehemently defend UC Berkeley property from any efforts to misdirect its use for the common good. In doing so, Mockupy Cal follows the lead of Chancellor Robert Birgeneau. Not only will we authoritatively dictate the uses of university resources without taking into account the opinion of anyone else on campus, but we will also pitilessly mock and defame any students, faculty, or workers who find themselves on the end of a police baton. The tactics of Mockupy Cal are straightforward: on Tuesday, November 15, UCMeP and its growing network of oligarchic allies will inhabit and erect defensive structures at prominent campus buildings and outdoor locations. Anyone who we deem unfit (or too ill-dressed) to enter these spaces will be denied passage, and consequently derided for their dearth of aristocratic character, portfolio diversity, and ancestral privilege. 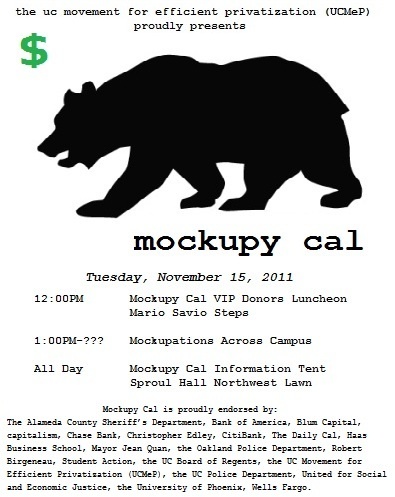 Mockupy Cal will start at 12PM on Tuesday by wresting control of Sproul Plaza. In the spirit of plutocracy, instead of setting up an all-inclusive encampment, Mockupy Cal’s first intervention will be to hold a gourmet champagne luncheon reserved exclusively for VIPs and anyone willing to pledge future earnings to the privatization struggle. Please make sure to bring your checkbook and two forms of ID. Following the luncheon, Mockupy Cal will move to preemptively defend other campus spaces from pernicious and pugnacious protestors. For more information on Mockupy Cal, please visit UCMeP’s official information tent, which will be pitched on the northwest lawn directly in front of Sproul Hall on Tuesday. Mockupy Cal is proudly endorsed by: The Alameda County Sheriff’s Department, Bank of America, Blum Capital, capitalism, Chase Bank, Christopher Edley, CitiBank, The Daily Cal, Haas Business School, Mayor Jean Quan, the Oakland Police Department, Robert Birgeneau, Student Action, the UC Board of Regents, the UC Movement for Efficient Privatization (UCMeP), the UC Police Department, United for Social and Economic Justice, the University of Phoenix, and Wells Fargo. We here at the UC Movement for Efficient Privatization (UCMeP) are proud to report that today’s “Equality Bake Sale” at UC Berkeley was an exemplary example of predatory privatizing power! 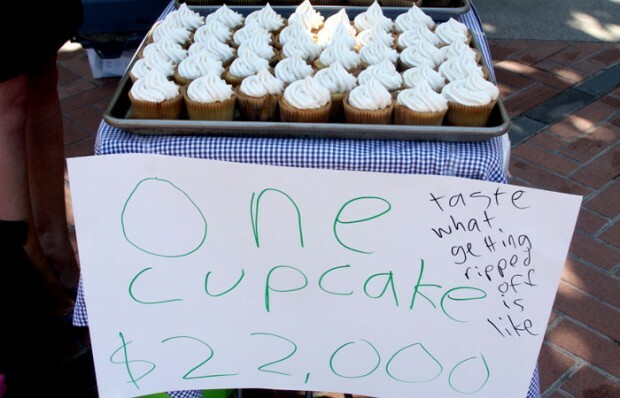 At $22,000 a pop (a subtle nod to what in-state tuition will be if the proposed 81% tuition hike goes through), the cupcakes we sold to hungry undergraduates raised over $1.8 million. Sure, all of that money came in as student loans provided by the generously usurious Citibank. But like the UC Regents, UCMeP is (almost) certain that the overinflated student loan bubble will never pop. And if it does, well, plutocrats like us won’t be the ones getting screwed! Considering the astounding success of today’s bake sale, who can honestly say that privatization projects at the UC are not profitable? Well, no one actually says that… most critics just claim that privatizing public education is reckless, exploitative, and highly unsustainable. For coverage of today’s “Equality Bake Sale,” see the Daily Cal. For more information on the “Equality Bake Sale” go here. Tomorrow (Wednesday, October 12) is the much anticipated “Equality Bake Sale” hosted by UCMeP. Come by Sproul Plaza between 12:00 and 2:00 to taste what it’s like to get ripped off! Read more here and here (The Bay Citizen). For years, sniveling students at the UC have echoed the same snot-nosed complaint: massive tuition hikes are unfair. Exemplary of such shrill whining are the obsequious objections to the 81% tuition increase recently proposed by UC President Mark Yudof (which will be considered at the November Regents Meeting in San Francisco). Such self-righteous bellyaching, however, intentionally ignores the crucial fact that the UC administration’s generously (and unilaterally) instituted tuition hikes epitomize what equality and economic justice have come to mean at the UC. Like the magnanimous Regents and administrators of the University of California, we here at the UC Movement for Efficient Privatization (UCMeP) ardently believe that all students have the right to pay equally exorbitant amounts to attend the UC, regardless of race, gender, ethnicity, or national/geographic origin. That ALL in-state students will soon be charged over $22,000 per year for their education (before housing, food, and other fees) is, quite simply, the epitome of fairness. UCMeP wholeheartedly agrees with the anger expressed over a certain “Diversity Bake Sale” recently held at UC Berkeley. While we are certainly sympathetic to the goals of the neo-conservative undergrads who organized the bake sale, UCMeP believes that the pricing plan instituted was not only unfair, but disgustingly invidious. We were appalled by how unabashedly it discriminated against affluent white men by asking them to pay fifty cents more than anyone else for a buttery scone. The inequity of the “Diversity Bake Sale” has prompted UCMeP to respond with its very own “Equality Bake Sale,” which will dramatize the immensely fair logic behind Mark Yudof’s proposed 81% tuition hike: everyone deserves to be ruthlessly exploited, especially when it comes to university tuition. 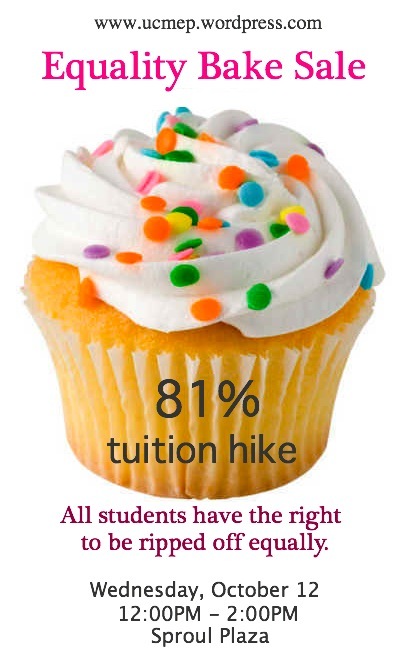 We fully expect (and hope) that—just like with UC tuition–most students will be unable to afford such a cheaply produced sugary treat at such an incredibly inflated price. To ensure that everyone has an equal opportunity to taste what it is like to get ripped off, UCMeP is pleased to announce that the gloriously usurious Bank of America will be on hand to offer high interest loans to anyone who qualifies. All you need are two forms of ID and the willingness to pen your name to a tortuously worded contractual agreement (that only requires you to sign away your future—much like student loans). We hope to see you all there! If you don’t come, you’re a communist! UC Movement for Efficient Privatization (UCMeP) · Privatize Now! Ask Questions Later.